Lucky DragonDimension: Dragon is the most famous symbol of luck in the Chinese culture. 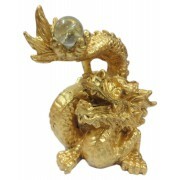 T..
Dragon is the most famous symbol of luck in the Chinese culture. The presence of the pictures or symbols of dragon attract the positive chi of good luck. Feng Shui masters often have the image of the dragon on their clothes in order to attract the favor of the mythical animal. The dragon in your home and office attract the powerful chi that stimulates the raving growth of the wealth. Tien Lung means the heaven. He is also called imperial dragon. The ball that the dragon chasing means wealth. This dragon has Gold color.